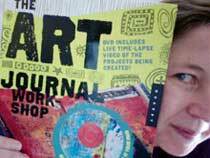 A quarterly subscription to receive different lovely spinning fibers hand-dyed by me every month for 3 months. 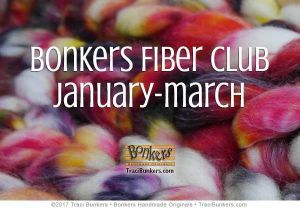 Club fiber will be either a new color and/or a new fiber that is only available to club members and is not part of my normal line at that time. Members can purchase more while supplies last and if there is any left, it will be available to the public 6 months after it was originally offered. The fiber in each quarter will be a surprise! There will be a variety of fiber content and no combination of color and yarn will be repeated. That means no matter how long you continue your subscription as a club member, each month you’ll get something new and always have something to look forward to. The fiber will mainly be ready-to-spin rovings of different types of wool and fibers blends that might include mohair, silk, rayon, bamboo, nylon, and stelina. That also means some will be hand wash and some will be superwash (or machine washable). I pride myself on quality and promise you they’ll never be gaudy synthetics and never be harsh or scratchy. The retail value of the total fiber, and perhaps other included surprise goodies, will at least equal or exceed the cost of the club! You’ll receive 4 oz of most fibers. But there might be a rare chance of me getting my hands on something super special that costs more. And in that case, the weight might be smaller. I will dye up a set quantity of fiber for each month, and when it’s gone, it’s gone with no guarantee that later it’ll be part of my normal line. So if you want to be sure to get more, sign up for a double, which means you’ll get double the amount of everything. If you like to live on the edge, sign up for a single and hope there’s some left if you want more. The fiber will be shipped around the middle of each month. • Hand-dyed with professional dyes that are colorfast and washfast. 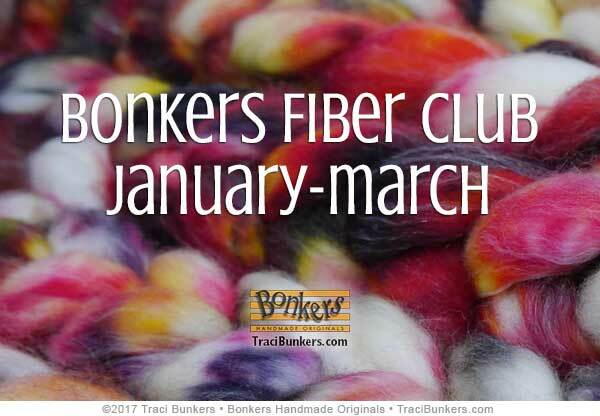 Products related to "Bonkers Fiber Club: Jan-March"
Monet's Water Lilies combines blues, greens and lavenders. Dorset Deletrius is mainly minty aqua and soft blue with pops of purples, golds, greens and pinks. Since this is Dusky, it also has black tencel streaks.